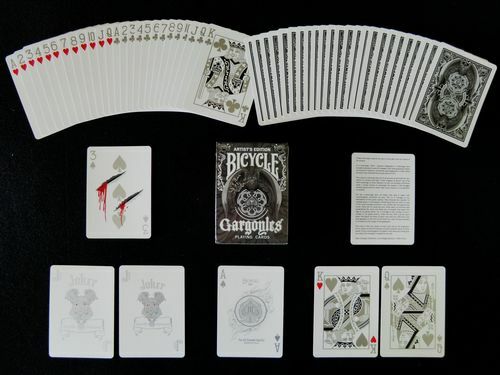 Produced by Diavoli Productions, the Gargoyles deck features artwork by Lance T. Miller, and was inspired by Gothic architecture. The original design can be found on the Gargoyles Expo deck, which was produced for the Label Expo Americas show in Chicago. After listening to feedback from the cardist community, Lance revamped the design to incorporate silver metallic inks (which had actually been intended in the initial Expo deck) and white to give it more contrast. The faces are all in grayscales, except the corner pips on the hearts and diamonds and the eyes of the Jokers, which are deep red. Comes with 2 custom Jokers (one big and one small), a custom Ace of Spades, a 3 of Spades gaff card with slashes on both sides, and an info card.